Bill Menasco discusses the math behind a puzzle involving a knotted a rope. You may not have heard of knot theory. But take it from Bill Menasco, a knot theorist of 35 years: This field of mathematics, rich in aesthetic beauty and intellectual challenges, has come a long way since he got into it. It involves the study of mathematical knots, which differ from real-world knots in that they have no ends. You can think of each one as a string that crosses over itself a given number of times and then reconnects with itself to form a closed loop. “It was considered a very esoteric field when I started in it, but it has grown immensely and grown in all different directions,” says Menasco, professor of mathematics, College of Arts and Sciences. Today, we know the study of knots could have applications in surprising areas. It could enable security firms to create better encryption systems or elucidate the mysteries of how the body unravels DNA, Menasco says. He’s a researcher who loves what he does: His office is filled with knot paraphernalia, and he can draw and build 3-D versions of complex knots from memory. Neighbors know him by his license plate: KNOTPROF. But in the world of mathematics, Menasco is perhaps best known, with Morwen Thistlethwaite, for solving the Tait Flyping Conjecture, one of three famous problems posed in the late 1800s by Peter Guthrie Tait, a father of knot theory. Below, Menasco reflects on the evolution of knot theory, from its whimsical, 19th-century beginnings to its uses in the modern world. Why do you think people are so curious about knots? “It seems to be somehow buried in our humanity that we’re interested in these things,” Menasco says. “You have to think that knots were some of the first technologies that our ancestors invented early on. What do knot theorists study? “The central question is pretty much the same as when I started: How do you tell two knots apart?” Menasco says. Knot theory seeks to encode information about knots — including what happens when they are altered in some way — into algebraic expressions that can distinguish one knot from another. While experts have devised expressions that can differentiate some knots from others, a formula capable of describing every knot uniquely remains elusive. How are knots relevant in the real world, besides being frustrating for people? Knot theory has uses in physics, biology and other fields, Menasco says. He elaborates on two examples. First, when cells divide, the DNA inside them must be replicated. This requires the DNA’s double-helix structure to unfurl, generate a second copy of itself that’s intertwined with the first, and then get untangled. To achieve this, enzymes help to cut, unknot and reconnect the strands. Knot theory provides insight into how hard it is to unknot and reknot various types of DNA, shedding light on how much time it takes the enzymes to do their jobs. In the realm of security, Menasco and his graduate students are partnering with the firm SecureRF to further develop the Algebraic Eraser, a security protocol that uses knots in cryptography. The protocol weaves mathematical information from knots into encryption keys that allow users to decipher secret data encoded in security badges, mobile payment devices and more. Do people ask you about your work all the time? “My wife is always asking me to unknot her jewelry,” Menasco jokes. Do knot theorists have any insight on preventing real-life knots? Menasco says while this isn’t his forte, scientists have done experiments in which they tumbled strings around in a box to figure out what causes tangling. The research suggests that one solution to preventing knots is to store ear buds, phone chargers and other annoying cables in smaller boxes. 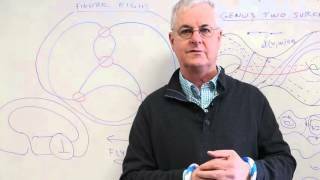 What are the origins of knot theory? Knots first came to prominence in the 1860s when scientists were trying to understand the nature of matter, Menasco says. At the time, people didn’t know that atoms were nuclei surrounded by electrons, so Lord Kelvin proposed a different theory: He hypothesized that the basic building blocks of matter were knots in the ether, a hypothetical substance that permeated space. He postulated that every element — hydrogen, oxygen, gold and so on — was made from a different kind of knot. The theory tantalizingly fulfilled some key requirements for a system of building blocks for matter, Menasco says: Many types of knots could exist, comprising many elements, and knots could be linked to form molecules. How did fellow scientists respond to Kelvin’s theory of atoms as knots? Peter Guthrie Tait, a Scottish physicist, began an extensive study and tabulation of knots, with the goal of understanding how to tell different knots apart from one another, Menasco says. Tait created, in essence, the basis for a periodic table of knots in which hydrogen would be the “unknot” — the unknotted circle — and heavier elements would be knots whose filaments crossed over themselves an ever-higher number of times. One of the last corrections to Tait’s table happened in 1973, when Kenneth Perko discovered that two of Tait’s 10-crossing knots were actually the same, Menasco says. These knots became known as the Perko Pair, reducing the number of known 10-crossing knots from 166 to 165. How did you become interested in knots? “Knot theory is beauty,” Menasco says. “I think geometrically and it fed into my strengths. Menasco is writing a textbook on mathematical discoveries that resulted from a 30-plus-year research partnership with Joan Birman of Columbia University and Barnard College. He hopes to finish the book, co-authored with his former PhD student Doug LaFountain, an assistant professor at Western Illinois University, this year. The topic? Two-dimensional surfaces associated with knots and links, which are chains of multiple knots joined together.